At Nguyen & Gribble, in Upland, CA. I litigate business, employment, and workers’ compensation defense cases through trial and settlement. I also conduct depositions of witnesses and medical experts in preparation for trial, in addition to drafting trial briefs and motions. Which class did you enjoy most at Chapman? I thoroughly enjoyed Trial Practice with Judge Rogan. Judge Rogan taught me how to own a courtroom through assertiveness, preparation and charisma. The lessons I learned from Judge Rogan allowed me to appear confident for my first jury trial, even though I was so nervous. I continued to remember his lessons and powered through my jury trial and won. I am forever grateful that I had the chance to have Judge Rogan as a teacher. 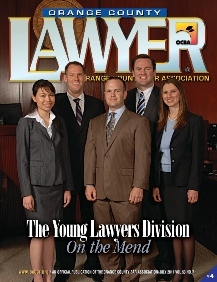 Please describe your contribution to the Young Lawyers Division. Having the privilege to serve as the Chair of the Young Lawyers Division, I have had the chance to work with my committee members, Jessica Hawari (Community Outreach Chair), Sarah Nowels (Education Chair), Simon Bubhwani (Social Chair), April Quinn (Sports Chair), and Michelle Tran (YLD Chair-Elect), in organizing numerous events dedicated to young professionals to connect and socialize with one another. Our goal is to provide an avenue for attorneys with four years of experience or fewer to learn from one another to successfully transition from law student to practicing attorney. In addition, YLD was invited to partner with the Irvine Chamber of Commerce to help organize the inaugural Emerging Professional's Leadership Summit to bring together young professionals from all industries to learn from successful CEO. What advice do you have for law students who will soon be seeking employment? Build a network and gain practical experience. It is imperative in this competitive job market to distinguish yourself on paper and in person. Any practical experience which is available through various organizations, i.e. Public Law Center, Legal Aid Society, Anaheim Family Justice Center, etc., will bolster your skill sets on your resume. In addition, network with other law students, attorneys, judges, and other professionals in the area to increase your visibility in the community and hopefully with prospective employers.